Joachim Roncin, the artistic director of a Parisian weekly called Stylist, was in an editorial meeting when the news of the shootings in Paris broke. Everyone rushed to their computers, where the story was unfolding on news sites and social media. “I didn’t have many words to express my pain,” Roncin told the French daily Le Progrès. The image he created and then tweeted, with the phrase “Je suis Charlie,” combining Stylist’s type with Charlie Hebdo’s logo pasted on a black background, “came pretty naturally.” Part of the reason it popped to mind, Roncin elaborated, was because of a book he had been reading with his young son—a book from a series that in France is called Où est Charlie? but is known to English speakers as Where’s Waldo? Usually you find Waldo at the beach, at the amusement park, at a football game, at the zoo, or maybe in the deep past of Aztec civilization. Waldo, or Charlie, is always looking straight at you, but he doesn’t advertise his presence. When you find him, it’s both a triumph and a relief—you were worried that this time the crowd might have swallowed him up for good. As slogans go, Je Suis Charlie has been unusually provocative. At its height, the UK’s Telegraph reports, the Twitter hashtag was being shared 6,500 times every minute. The backlash was almost immediate. By the day after the shootings, media outlets were running blog posts entitled “Je Ne Suis Pas Charlie,” “Je Ne Suis Pas Exactement Charlie,” and “Pourquoi je ne suis pas Charlie.” The reasons are various: distaste for offensive comics, wariness of Islamophobia, simple fear. But there’s something in the grammatical structure of the phrase itself that is troublesome. Je Suis Charlie is not just a statement of support; it’s a statement of dissolution into a collective identity. Even within the liberal backlash, there are arguably two warring strands of public sentiment: one for an inclusive sense of solidarity and interconnectedness in French society; and one for protecting individual differences of opinion, and a disavowal of groupthink at its unthinking worst. This is in keeping with a broader shift in contemporary life, in which group membership is less and less normalized. How can we express political solidarity when we are uncomfortable with groups, even in our private lives? Sociologists and casual commentators have all noted the increasing isolationism of contemporary North American life—a much-cited study found that the average number of close confidants reported by respondents dropped from three in 1985 to two in 2004. Nearly 50 percent said their spouse was the only person they confided in, and a quarter of respondents reported having no one to confide in at all. 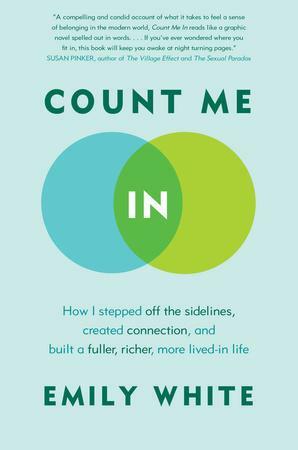 In Count Me In: How I Stepped Off the Sidelines, Created Connection, and Built a Fuller, Richer, More Lived-In Life, Emily White (author, previously, of Lonely: Learning to Live with Solitude) goes looking for a sense of community: in churches, volunteer groups, community gardens, and activist networks, with varying degrees of success. It’s easy to romanticize the collective life that North American society has lost in the past 50 years or so, with its Elk Clubs, Legion Halls, and church socials. These organizations seem to represent a more caring society, in which neighbours knew one another and no one worried about children playing unsupervised in alleys and yards. Those who worry that Westerners are getting lonelier and more isolated mourn the informal support networks these kinds of groups created. But White explores the paradox of why, even as she actively searched for connection, a part of her shrank from it. Putting oneself in a category, aligning with a collective, may come with a greater expectation of conformity. And social belonging has its dark side. For example, on December 23rd, media reported an incident at an Elks Lodge in California in which a performer sang a song celebrating the death of Michael Brown. The song had lyrics like, “Michael looked like some old Swiss cheese, his brain was splattered on the floor.” An apology issued by the Elks Lodge said that the song was performed at a private party, at which most of the attendees were not Elks members, though the organizers were. From the leadership’s point of view, an outrageous action on the part of a minority of the membership made the whole group vulnerable to criticism. It may also be true that social pressure to conform made attendees at this event more ready to cheer a racist song than they would have been if left to themselves. Similarly, in 2012 a branch of the Royal Canadian Legion publicly apologized for printing a joke in its newsletter about it being legal to shoot Indians in Saskatchewan. And White’s own attempt at finding belonging in the Catholic church (her own faith) was stymied by the homophobic attitude she encountered. The Western cult of the individual is not solely a product of consumerist, narcissistic tendencies; it’s also a response to the 20th century’s more lethal iterations of collective culture, i.e., Nazism and Stalinism. Group belonging usually rests on a certain sense of exclusion and differentiation from those who are not in the group. Holding oneself apart from groups can mean trying to gain intellectual distance from the dominant ideologies of the day. Waldo, or Charlie, represents a certain kind of nightmare of the individual lost in the collective. He is surrounded by false doppelgängers, the striped beachtowels and red jerseys, the bicoloured traffic barriers and cherry-topped vanilla sundaes. He depends upon us to affirm his individuality, not to allow him to be swallowed up. The Charlie of Je Suis Charlie is hiding in plain sight, a distinct figure in the kaleidoscope of outrage and recrimination. He draws his meaning from his unmistakable singularity, but also from his immersion in the greater tableau of human life. He matters because he reminds us that we exist in groups, and that we are still recognizably ourselves.